This is brilliant! No more chapter number for me. Thank you so much for this VERY helpful instruction. I, too, have been using chapter numbers. You've won me over. I also like the idea of adding tags. I'd not thought of that. This sounds wonderful, but I've tried using Scrivener for a non-fiction book I'm writing and I hate having to admit I don't get it AT ALL. The more I read about it, the more I wonder if it's only easy for people who know this stuff inside and out. Can you give me some encouragement? It's not as if I don't know anything about word processing or using the computer. I've built two websites--one on Blogger and one on WordPress--and I use Word for most of my writing. I've started this book on Word and have been working to transfer the chapters to Scrivener. I have a couple of them there but can't seem to get the others to move over there. I also can't figure out how to use that nifty bulletin board. I seem to be stuck on the first few pages of the tutorial because suddenly nothing is making sense. Mona -- look on YouTube for tutorial videos, that might be easier to follow. I think there's two things for you to keep in mind: As I mentioned, mid-project is probably not the best time to try Scrivener. I've also tried to move documents into it, and although it can be done it's also a distraction from the actual work you need to do. 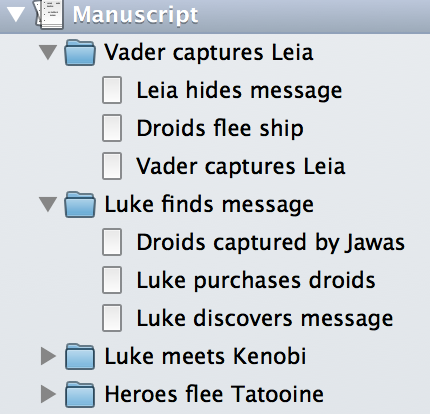 The second thing is to not feel like you're missing out if there's features of Scrivener you're not using. The cork board is pretty in screenshots, but ultimately not very useful after you've passed the outline phase. All those things may come in handy at some point, but to go in feeling like you must use them will probably just muddy things for you. If nothing else try just using it like word, but keep your work in more manageable chunks like the "outline as chapter titles" example I gave. Caveat: I can see how non-fiction might also require a lot of page-layout related features (images with captions and what not). I don't know anything about writing non-fic, but if you're doing that kind of thing Word might be better for you. I also love Scrivener and was very concerned about switching over in the middle of my WIP was was about 80% complete for a first draft at about 90K words. However, after reviewing, I did make the switch and within two days had greatly improved my productivity. Therefore, even for WIP, the switch can provide immediate benefits. I have written a blog similarly on how I use it and the benefits derived. Keep well. Hello and thanks for the great info about Scrivener. The first story I have use Word as many/most others I guess but now im ready for Scrivener but as I am so new to all of this world I have some dumb questions so please bear with me. 1- Can I use scrivener the same way as Word, I just want to see the same look as in word for e.x one A4 Page layout and want to continue this way as page 1 - page 2 e.tc. Is taht possible ? I dont want to be fiddling around with scenes, chapters and so on, I just want to write it as one long document, allright! And you may wonder, why does this dude want to use Scrivener for then. I want to use the easy way to have notes and the coarkboard for an e.x and surely I can split up my story and make chapters later, right ? Yes if you wish you can write in one long single document. Keep in mind with Scrivener the page size and formatting stuff is all choices you make when you compile your document, so you really don't need to worry about those things while writing. Once you've got a bunch of work in there, you can use the "Split Document" feature to break it into multiple parts should you decide to start taking advantage of that. I use this all the time. Thank you very much sir, for the answer! I have done the tutorial but I dident find out really about it, it was much to comprehend and the program seems really fantastic in every way. Right now I am on my second story in word and right now I have written 17536 words and are on page number 31 so you can see there is much text. I guess im rambling right hehe.